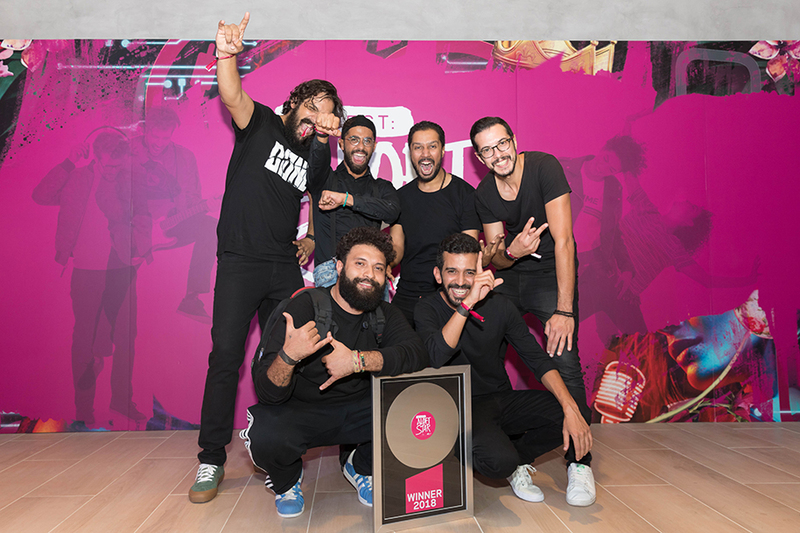 Egyptian group Almena have been crowned the winners of the Project: Aloft Star UAE competition, after months of going up against other regional artist — though all is not lost for their competitors. Almena beat out three other finalists, which included the Emirati-Honduran singer Fafa, Lebanese singer Jay Abo and Saudi rap artist Molham, all of whom are currently finalists in another regional talent search titled Yasalam Emerging Talent Competition. But Almena’s high-energy music set them group apart this time. With their big personalities and sense of humour, the six-member band have signed to Universal Music Group MENA. As the winners, they will record a single at the iconic Abbey Road Studios in London and release it digitally worldwide. Almena, whose name is the Arabic word for ‘port’, formed in 2015 in Egypt. Their musical identity is based on experimenting with multiple genres and mixing jazz, hip-hop, reggae and blues with their traditional Alexandrian flare. Their mission statement involves advancing contemporary Egyptian to new realms. “Pleased and honoured to be the winners of Project: Aloft Star UAE 2018. The journey begins now,” the group said after their win earlier this month. They also thanked their fans, adding that they would be nowhere without their support. Almena are active on social media, with upwards of 14,000 followers on Facebook, and have already released original music online. In September, they debuted the upbeat single Saheb in collaboration with Ahmed Bahaa, a member of the fellow Egyptian group Sharmoofers. “We are very excited to have Almena on our roster, they are a hugely talented and experienced band and bring a fresh take to the scene,” said Patrick Boulos, CEO of Universal Music MENA. Almena is one of many fusion bands emerging in the Middle East. They create a distinct blend of sounds by layering Eastern and Western instruments, with vocalist Youssef Nour on the trumpet, Adham Al Habashy on the oud, Mohammad Affara on lead guitar, Ahmad Abd Elrasoul on bass guitar, Omar Aly Abdou on keyboard and John Sadek beat boxing. UAE-based R’n’B singer Stephon LaMar, who originally hails from North Carolina, was last year’s Project: Aloft Star UAE winner. The American artists released the track Love on the Internet, along with an accompanying music video, after his win. The competition kicked off on September 18 this year. It was open to all unsigned artists above the age of 21, who had to submit a short biography and a video of themselves performing an original song to be considered. In the final stages, shortlisted artists were mentored by figures in the music industry, including Lebanese singer Anthony Touma, UAE-based DJ and producer Shaun Warner, Revolt Magazine founder Big Hass and Anghami’s Mark Shakedown.